So your son has discovered ninjas. It's all down hill from here. He will be asking for nun chucks, and stealth training so he can "walk in the shadows" to defeat evil doers. You thought he had a few more years before this became an obsession. But nope. It's here now. And it doesn’t seem to be going anywhere. You might as well just accept your fate. Besides you think ninjas are pretty awesome too. You had a phase when you were younger where you tried to learn how to throw ninja stars. And use sai weapons like Raphael from the Teenage Mutant Ninja Turtles. Your mom was not happy to come home to find holes in all of your bedroom walls. This Halloween get your little ninja-to-be this Child Blue Stealth Ninja Costume. Maybe it will get the need to "walk in the shadows" out of his system. And if it doesn’t just remember to buy him foam weapons. He will be so excited when he puts this costume on, he will try to disappear right in front of your eyes. 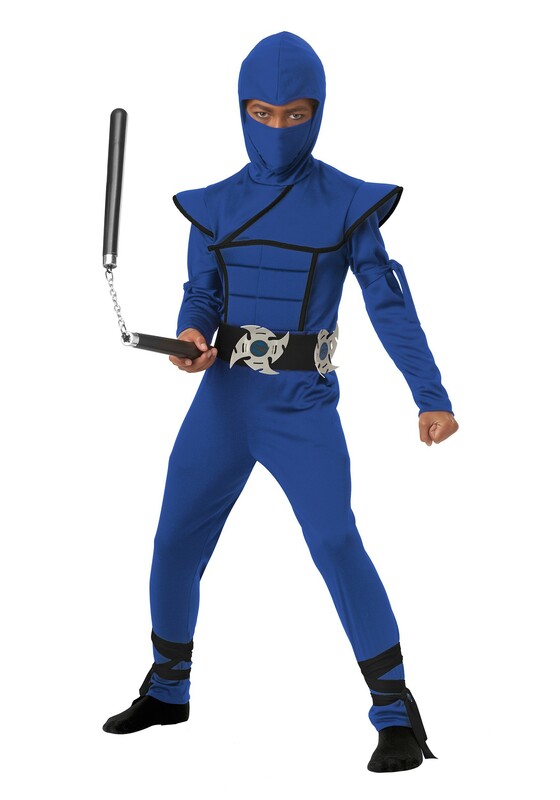 And who knows, maybe through his interest in ninjas, you can rekindle your interest in them too. Then you can share the original Teenage Mutant Ninja turtles with him. Both of you trying to swing nun chucks around, and accidentally putting holes in your living room walls. Then demanding pizza after a hard night of ninja-ing.